1pc/ pp bag ,50pcs/Ctn , CTN size67*31.5*19cmNW :9.5kgs ,GW:10.5kgs ,or according to your requirement. 7. Collapsible,easy to take when you go travel or have apicnic,also could Save space . Dongguan shengyan industrial Co.,LTD one of "white hair" of silicone products business in china since 2004. Our core competencies is "SILICONE KITCHENWARE AND SILICONE GIFT". 70% of our silicone proudcts is exported to Japan, Germany,North American and Europe. we always to offer our customers the best competitive advantage PRODUCTS. 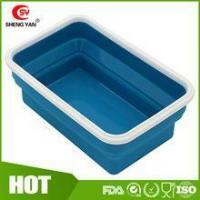 We are one of the frist mover IN CHINA for silicone products with silicone kitchenware and promotional silicone gift. we had the honor to serve many of the famous brands of sell and promotional our silicone products allover the world such as" Swath of Switzerland,Barilla of Italy,Coca-Cola of USA,Nestle of Germany, "
WE BELIEVE THAT " THE QUALITY IS THE SOUL OF AN ENTREPRISE".